Finally. Finally. Someone has raised the bar. 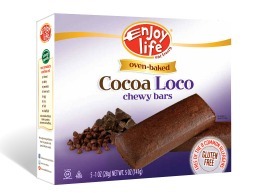 Thanks to Enjoy Life Foods you can now say goodbye to hard, crunchy and hard to chew bars. Enjoy Life Foods Chewy Bars are a must try. With four delicious flavors these bars are perfect for morning, mid-day or even as a substitute for those (like me!) that have an after-dinner sweet tooth. I love the Caramel Apple or Very Berry variety in the morning, the Sunbutter Crunch as an afternoon snack and the Cocoa Loco for a sweet treat. My favorite though is the Sunbutter Crunch… a nutty treat for those that can’t have peanuts. Enjoy… and go nut-free! Besides being gluten-free, these bars are also free of the eight (8) top allergens: Wheat, dairy, peanuts, tree nuts, egg, soy, fish, and shellfish. Leave it to Enjoy Life Foods to make a bar that is chewy & delicious – without the most common allergens. Cheers & Congratulations to Enjoy Life Foods for being this week’s Friday Favorite on BeFreeforMe.com. Enjoy… Life…! This entry was posted on Thursday, April 26th, 2012 at 9:51 pm	and is filed under Friday Favorites. You can follow any responses to this entry through the RSS 2.0 feed. You can leave a response, or trackback from your own site. I buy the Sunbutter Crunch bars and love them. I keep them in my car and my desk at work as a safe snack on busy days. Love the “Enjoy Life” food products. Most are tasty. Their chocolate is delicious!